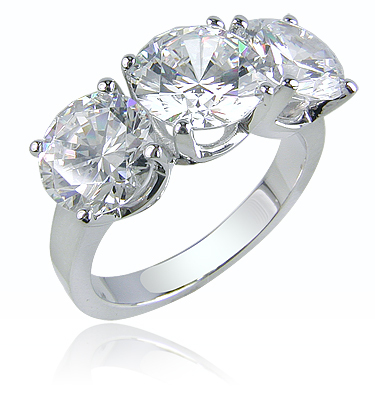 This Three Stone Round Cubic Zirconia Anniversary Ring features a 2 carat round center stone with 1.5 each each round stones on either side. 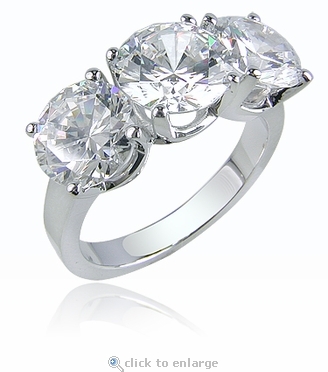 This is a traditional three stone round anniversary ring that is taken to another level with beautifully sized round cubic zirconia. 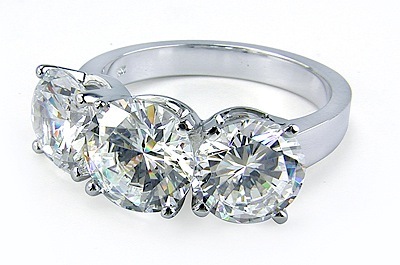 The total carat weight on this three stone cubic zirconia anniversary ring is 5 carats of the finest hand cut and hand polished diamond look Russian formula cubic zirconia. The shank on this ring measures approximately 3.25mm at the widest point. This three stone round anniversary ring can be worn on its own as a statement ring, as a right hand ring or couple it with a great band to make a beautiful wedding or bridal set.